The North Korean soldier who sustained multiple gunshot wounds as he crossed the border to defect to the South last week has regained consciousness and will survive, his doctor said on Wednesday. 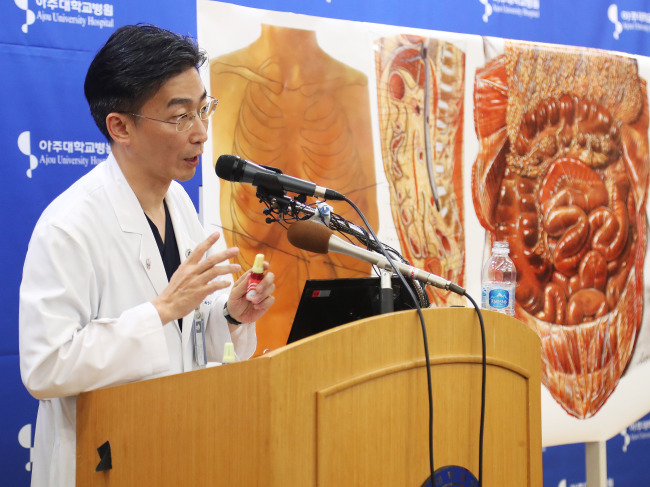 “The patient will not die,” surgeon Lee Cook-jong at Ajou University Hospital in Suwon said in a press briefing. Lee said that it will take about a month for the soldier to recover enough to be interrogated by the authorities. “The patient is fully conscious,” Lee said in a statement released ahead of the briefing. The soldier will continue to receive treatment in the intensive care unit for a few more days until it is clear there won’t be further infections, Lee said, adding that the hospital will then closely consult with related agencies regarding the patient’s treatment and transfer. The soldier was shot multiple times by North Korean border guards as he ran across the border and through the truce village of Panmunjeom on Nov. 13. He was taken to Ajou University Hospital at 4:53 p.m. that day by the US Forces’ DUSTOFF casualty evacuation team. The soldier had five gunshot wounds, one each to his right hip, the left side of his back, left armpit, right shoulder and right knee. The medical team including Lee performed an emergency surgery just 30 minutes after the patient’s arrival and a second surgery two days later. The patient started breathing on his own three days after the second surgery. He is receiving treatment for an infection of parasitic worms, tuberculosis and hepatitis B.